Trains. They whistle across the great distances and hold us spellbound by the mystery of where they have been and where they are going. Where is the child that does not love a train? 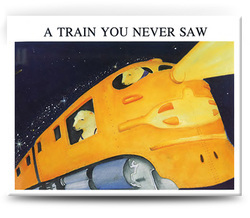 In this most endearing book are the most wonderful trains of all. From the first Plain Train that "goes in circles on the floor" to the Mean Green Train, the Dinosaur Train and the Rainbow train, get ready for a delightful journey. "A Rainbow Train goes fishing in the land of ice and snow. Oh, wouldn't you like to travel where the Rainbow Trains can go? Or ride a big Sand Castle Train? Hoo-ray, Hoo-roo, Hoo-rah! Oh what a splendid sight to see a train you never saw."